The Moon Under Water Pub & Brewery out of Victoria have 4 standard beer in their lineup. One of these 4 beer is the “The Victorious Weizenbock” a strong, dark wheat beer. While most Bock beer are lagers a Weizen Bock is always an Ale. 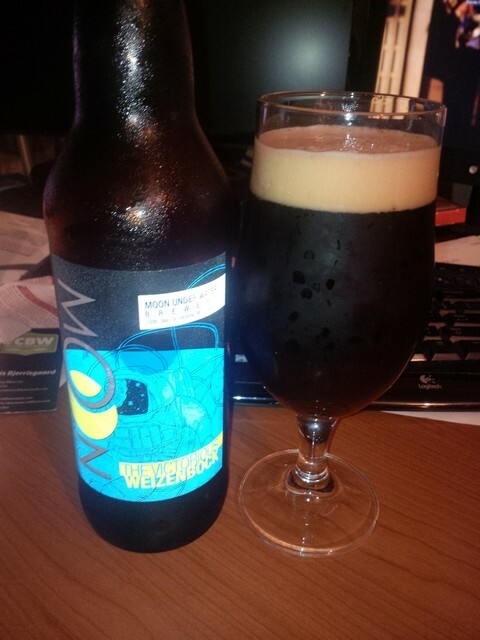 The Weizen Bock pours a deep reddish brown colour with a tan head. The aroma consists of sweet fruits such as apricots, bananas and prunes with a wheat base. The flavour was of dark fruits such as prunes with bananas and apricots as well as caramel, nuts and possibly a hint of sour. The alcohol content of this brew is a strong 8.2%. This is a very tasty beer but this style of beer will be quite different for many people. This entry was posted in Imperial, Weizen Bock and tagged apricot, apricots, banana, bananas, bc, beer, brewery, canada, caramel, dark fruit, dark fruits, hint sour, mild sour, moon under water, nut, nuts, prune, prunes, pub, sour, victoria. Alright! I was hoping you’d like this one. It took me awhile to get a fair sampling of it and I really enjoyed it. Have you seen their limited release Maibock yet?